Hot Dogs, hard work, legends and hootch. 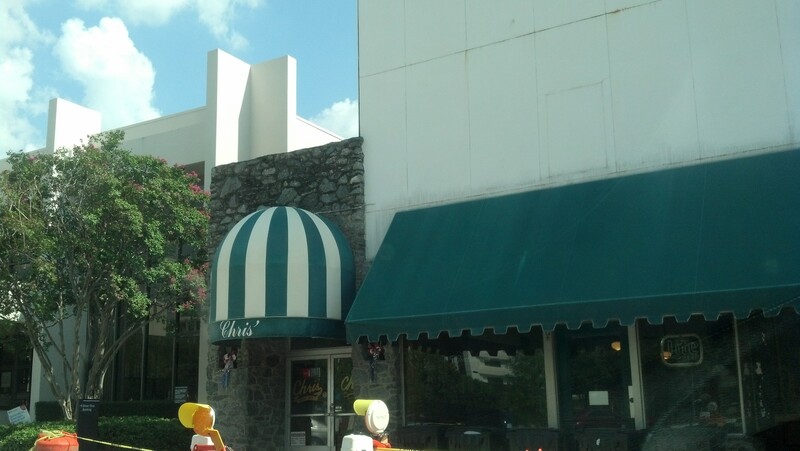 Chris’s Hot Dogs is located on historic Dexter Avenue in Montgomery Alabama. 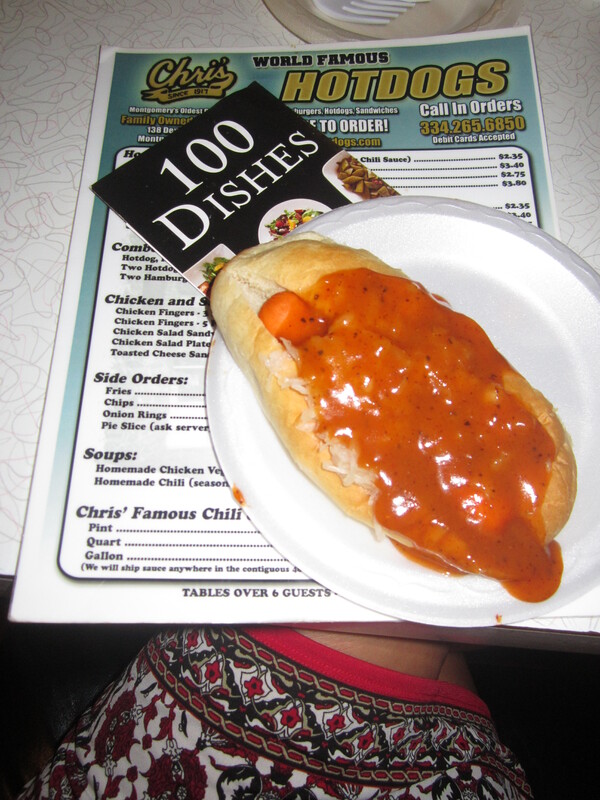 I would suppose this hot dog joint made it on the “100 list” due to a long run. Having been in existence since 1917, a host of characters came through the doors during historical events, including prohibition. Crossing this off my 100 list was fun. I had won a raffle that included 4 free meals at Chris’s. I had great company and then there are the wiener jokes. My 12 year old inner self loved this visit. Know that I held back my real thoughts; I tried to keep it clean but be forewarned. The story goes that Chris came to the USA from his home country of Greece. He went through Coney Island and settled into Montgomery Alabama where he had family that operated a restaurant. His experience with wiener stands at Coney Island gave him a great idea and he struck out on his own selling newspapers and hot dogs. Over time, the window grew to a counter and in the 1940’s a dining room was added and wieners were at one time, sold 24/7. So I walk in and immediately realized that I was in another dimension. I saw a host of interesting characters sitting at stools who all glanced at us as if we were one of the third kind. An uncomfortable moment as I caught a glimpse of the nasty filthy dirty sauce festering in an area where the food is put together. On the upshot, I had to pause and realize that all it takes to make a legacy is a burner and a grill. I admire that. 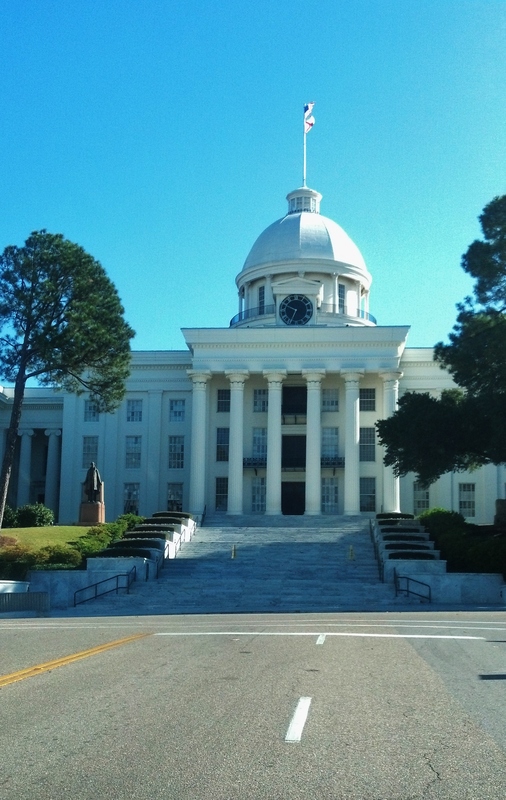 Because of this proximity to the Alabama Capital, many politicians sat at the counters alongside families. It is reported that the likes of Martin Luther King, Rosa Parks, Elvis, George Wallace, FDR, Whoopi Goldberg and Oprah are among the patrons. The walls are lined with articles and a few photos of politicians and some celebrities, as well as notes to the owners are on display. 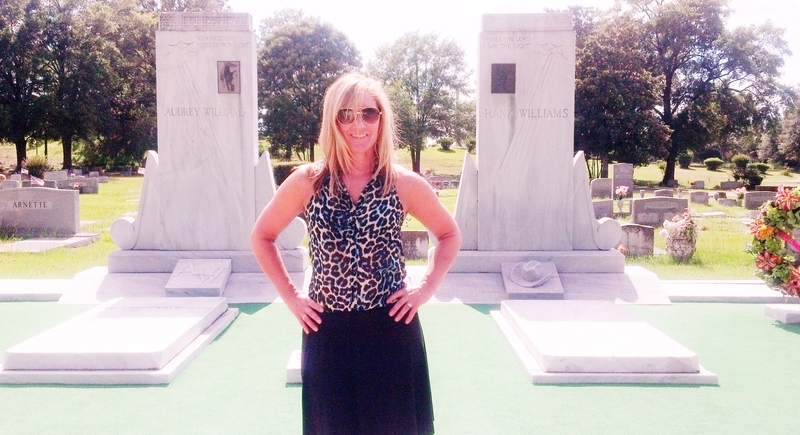 The most famous patron was Hank Williams, who reportedly was kicked out late night many times. There are no photos of that. As far as Whoopie and Oprah, I have to wonder if this is urban legend, and if not, what they might have thought. Oprah was recently on this street shooting her next film “Selma,” so this visit is plausible although, the news reported where she ate and I did not see Chris’s mentioned. The menu is basic greasy spoon food. I ordered the Chris’s special hot dog which is your basic hot dog served on a basic bun with mustard, kraut and Chris’s special and legendary sauce. And, if size matters to you, there is a special with two dogs in one bun. For $2.50 you get about 6 inches of goodness. Wiener, you are a hot mess! I am going to go out on a limb and say that this one was not in the wieners circle. The many reviews were nearly as entertaining as the visit. The reviews fell into two categories; nostalgic love and extreme disgust. A few of the quotes;“Past its prime,” “depressing bygone relic,” “don’t use the bathroom before you eat,” “Hank peed here,” “run down and dirty but clean enough to apparently pass an inspection,”“tired décor and cleanliness not a priority.” On the nostalgic front, I heard violins, singing angels, and aliens. For example, one reviewer wrote, “A magical experience.” Yes, that is true, if you are a stoner. More accurately would be, “hats off to skirting health codes and inspectors.” Having said this, quite possibly, this could be a perfect place to go after bars. Take note, they close at 7 p.m. folks. Better yet, if you love Budweiser, history and wieners, make this your daytime go to place. This is the second time that I have been disappointed while visiting places on my “100 list.” I can only imagine what this place could be with some TLC and pride. In fact, It would be such a fun place to have. I read some reviews from people who travel to Alabama from many places in the USA and from all over the world. IYIKES! Alabama has so much to offer. Check out my MEGatips. I sadly have to give this place only * MEGastars for Nostalgia and a good time. Want a great hot dog at a fun place? Try the food at The Montgomery Biscuits Stadium. There is some dog gone good wieners and biscuits there. And DO NOT miss those biscuits! What is considered a 7 course meal? A hot dog and a six pack. Why were the hot dogs shivering? Because they were served with chili. ← Kiss my…Why, Kiss My Turku?